I bought it. I love it. What is it? I saw this bush at Home Depot here in Tampa, Florida. The tag said, "FWR CALYX" I don't believe that is the name of the plant as calyx is just a part of a flower. The folks at Home Depot were no help. I bought it anyway because I love the shape and color of the leaves (green on top and maroon under). The curly shape of the leaves and pyramidal flower clusters look lovely as they are hit by the evening sun and cast their shadows on the wall. It is a great contrast to the pygmy date palm next to it. The flowers are 5 petaled, white with violet center and a sprinkling of violet dots on the lowest petal. The calyx consists of tiny green spiky sepals. The plant is three feet tall and a tree shape, but others at the nursery were bushes. Except for evening, I have the bush in shade. I haven't taken it out of the pot yet.....waiting to see how it does in the location. I hope someone can help with an ID. I am not absolutely sure because of the color on the bottom of the leaf but other than that it looks like my laurel bush by the shape of the leaf, and the flowers. At first glance, I was planning on telling you it's an Indian Hawthorne but that is incorrect. 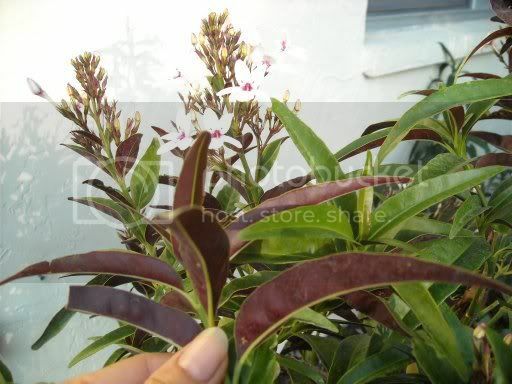 I keep coming back to your thread because I know I've seen this plant and cannot place the name. I've been needing an excuse to visit my favorite nursery in town... if I see it, I'll let you know. I believe it is a tropical plant that the big boxes sell in spring and summer. Unfortunately I can't remember the name.... maybe one of our Florida or Southern Cal members will know it. They will grow quickly and fill holes in the garden, but you can figure them to be merely annuals unless you can bring them in in the fall. Thank you to the three who posted. I have followed up a bit on all the leads, but no ID so far. I do live in the tropics, and this was sold as a "landscape plant". I am glad for any ideas. I really want to know what this is. Just to let you know I haven't forgotten about you. I know this plant and it is driving me crazy that I can't ID it. I checked the nursery and Home Depot - cannot find it. Love this tree....what is it?? ?